In June 2015, we launched our guidance on smoking in secure mental health settings. The guidance summarised the strong evidence base relating to the harms of smoking for adults with mental health conditions and what could be practically implemented to support services progressing to smokefree. It also looked at what commissioners could do to incentive this focus on prevention and evidence based cessation support in line with NICE guidance. A year or so on, we were delighted that a number of services showcased their progress at our PHE national conference in September, demonstrating clearly that tackling our biggest single cause of preventable mortality in people with mental health conditions is no longer in the ‘too difficult box’, and importantly, that mental health services are spearheading the way towards our ambition of a tobacco free NHS. With progress, however, comes more questions. One of the first we were asked at a local event in Yorkshire last year (following the launch of our guidance with commissioners and providers of mental health services) was around the impact on smoking in children and young people - is there more specific evidence for this population and crucially was there any transferable recommendations in our guidance to support CAMHS services? In partnership with the NHS England Programme of Care Board for Mental Health we convened a wide range of experts and stakeholders to answer these questions. We identified the following three areas of important evidence relating to children and young people with mental health conditions. The evidence shows that those who start smoking in their teens are much more likely to continue smoking as adults and become heavy smokers. Two thirds of adult smokers in the UK started before their teens and the life-course impact shows that young smokers are more susceptible to the harms of tobacco. 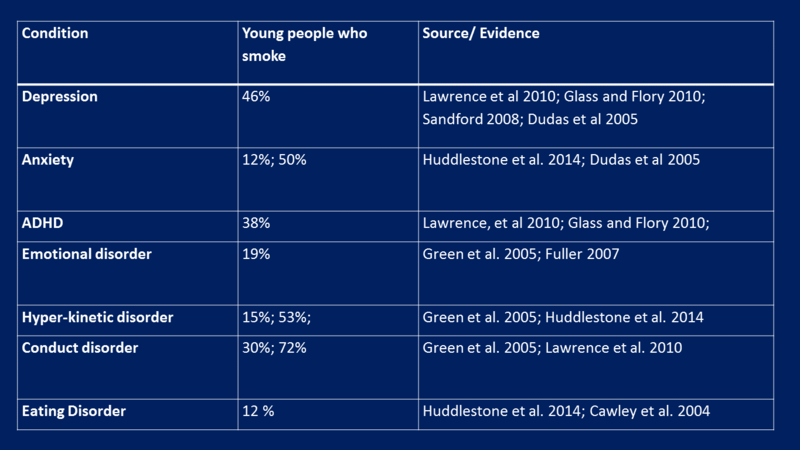 We also found that many young people who take up smoking during adolescence experience difficulties engaging with standard cessation services. When we honed down into the evidence for those accessing CAMHS services we found a limited evidence base, but what we did find from smaller published studies suggested that children and young people accessing CAMHS demonstrated a high awareness of the harms of smoking, but lacked confidence and motivation to quit. This in itself highlights the window of opportunity to intervene to support cessation early, and prevent the long term harms which are so clearly documented. At general population level, smoking prevalence in children and young people is declining overall. In 2014, the NatCen survey found 8% were classified as frequent smokers at the age of 15. However, we know that prevalence varies between different population groups in children and young people, for example evidence showed that smoking is more prevalent in looked-after-children who are themselves at higher risk of developing mental health conditions. In partnership with NHS England we surveyed their commissioned CAMHS services to ascertain prevalence amongst service users. Our service estimated that overall smoking prevalence in CAMHS is estimated at 13%, with prevalence amongst staff slightly higher at 16%. 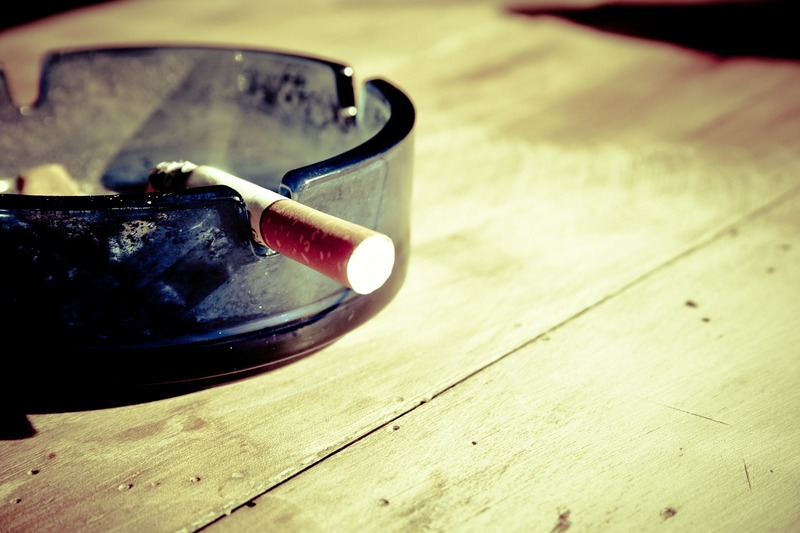 However, this survey masks the complexity of smoking prevalence by specific mental health condition in children and young people, with the literature showing prevalence rates in children and young people range from 12% for those with eating disorders, to 46% for those with depression. In terms of age groups, a separate study showed prevalence to be 35% among 11-15 year olds accessing care in English Tier 3 and 4 units. The prevalence data informs potential action within services. A joint report by RCP and RCPsy highlights the importance of focusing attention to targeted populations, such as children who access CAMHS and because of the aforementioned evidence that younger people may be harder to engage and be more ambivalent about their tobacco use, piloting initiatives within CAMHS units provide an opportunity to evaluate innovative ways to reach young people. NICE guidance notes specifically that in-patient care in specialist units such as these may represent a unique opportunity to intervene. But how do we support such initiatives? Encouragingly many mental health trusts are currently engaged in efforts of making inpatient units smokefree. Our survey of mental health units in England has highlighted that 77% of units of NHS England commissioned low and medium secure units were already smokefree with a further 21% highlighting smoke free policies across site buildings, further highlighting the impact of last year’s guidance. A new briefing provides further recommendations for commissioners and the levers they can use to reduce smoking and its life-course impact in children and young people with mental health conditions, and make the ambition of a smokfree NHS a reality. This briefing should be a call to action to ensure that action is a priority amongst children and young people with mental health conditions. Alongside this we also conclude further research is needed in terms of ‘what works’ for smoking cessation for those under the care of CAMHS, and the impact and interaction between the different conditions outlined above. It’s now time to take tackling the harmful long term impact of tobacco smoking in our children and young people with mental health conditions out of the ‘too difficult box’.